Not to be confused with glycerol 3-phosphate. Glyceraldehyde 3-phosphate, also known as triose phosphate or 3-phosphoglyceraldehyde and abbreviated as G3P, GA3P, GADP, GAP, TP, GALP or PGAL, is the metabolite that occurs as an intermediate in several central pathways of all organisms. With the chemical formula H(O)CCH(OH)CH2OPO32-, this anion is a monophosphate ester of glyceraldehyde. Fructose-1,6-bisphosphate (F1,6BP), catalyzed by aldolase. Compound C05378 at KEGG Pathway Database. Enzyme 4.1.2.13 at KEGG Pathway Database. Compound C00111 at KEGG Pathway Database. Compound C00118 at KEGG Pathway Database. The numbering of the carbon atoms indicates the fate of the carbons according to their position in fructose 6-phosphate. Dihydroxyacetone phosphate (DHAP), catalyzed by triose phosphate isomerase. Compound C00111 at KEGG Pathway Database.Enzyme 5.3.1.1 at KEGG Pathway Database.Compound C00118 at KEGG Pathway Database. 1,3-bisphosphoglycerate (1,3BPG), catalyzed by glyceraldehyde 3-phosphate dehydrogenase. To produce 1,3-bisphospho-D-glycerate in glycolysis. Compound C00118 at KEGG Pathway Database. 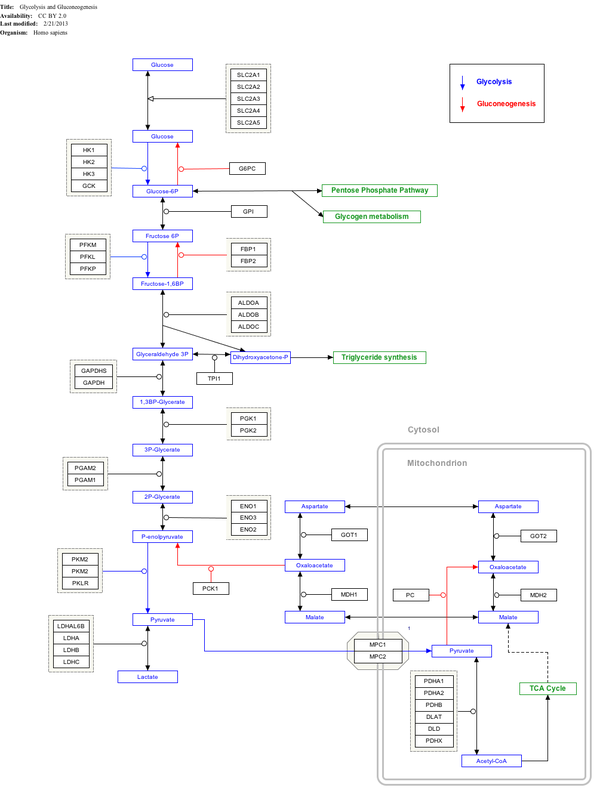 Enzyme 1.2.1.12 at KEGG Pathway Database. Reaction R01063 at KEGG Pathway Database. Compound C00236 at KEGG Pathway Database. D-glyceraldehyde 3-phosphate is also of some importance since this is how glycerol (as DHAP) enters the glycolytic and gluconeogenic pathways. Furthermore, it is a participant in and a product of the pentose phosphate pathway. During plant photosynthesis, 2 equivalents of glycerate 3-phosphate (GP; also known as 3-phosphoglycerate) are produced by the first step of the light-independent reactions when ribulose 1,5-bisphosphate (RuBP) and carbon dioxide are catalysed by the rubisco enzyme. The GP is converted to D-glyceraldehyde 3-phosphate (G3P) using the energy in ATP and the reducing power of NADPH as part of the Calvin cycle. This returns ADP, phosphate ions Pi, and NADP+ to the light-dependent reactions of photosynthesis for their continued function. RuBP is regenerated for the Calvin cycle to continue. G3P is generally considered the prime end-product of photosynthesis and it can be used as an immediate food nutrient, combined and rearranged to form monosaccharide sugars, such as glucose, which can be transported to other cells, or packaged for storage as insoluble polysaccharides such as starch. 2 G3P → glucose (6-carbon). Glyceraldehyde 3-phosphate occurs as a byproduct in the biosynthesis pathway of tryptophan, an essential amino acid that cannot be produced by the human body. Wikimedia Commons has media related to Glyceraldehyde 3-phosphate.